I am very happy to announce my First Event and Give Away and Badges. I was very confused since long that which theme i should choose for my First event. So two things banged in my mind. First is i am a complete sweet person. Second is first time i am celebrating occasions with my blogger friends and in India we do shuruwat/pahal (start) with sweets and third reason is This is my 101 post. So its one kind of Shubh Din (auspecious day) to start my event. So finally i chose Theme-Show me your Dessert. I will reveal my Give away later in this month. So guys send some vegetarian yummy sweets/desserts. Give Away is only for Indian Residents. For International participant i will give personalized badges if chosen winner. There are badges for Top Contributor, Most Tempting Sweet/Dessert and Well Explained Recipe. Please read rules carefully. Its Very important. No limit to the number of entries. 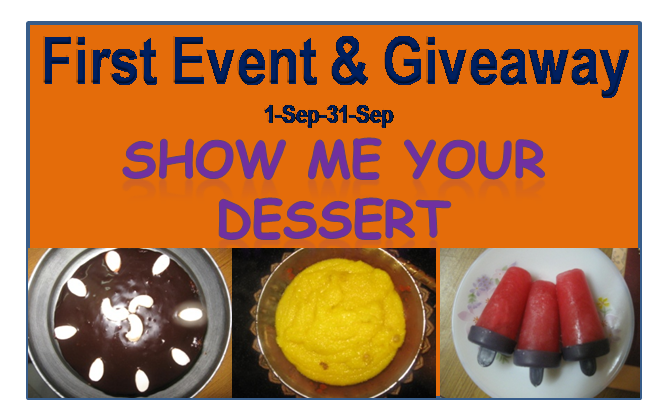 Recipe Should be posted between Sep 1-Sep 31st on your blog. Use of logo is compulsory. Dated entries will be accepted if they are re-posted in this month and linked back to this event. You need to follow my blog and leave a comment here. You need to Like my Facebook Page. Send entries between 1 Sep- 31 Sep.
You can send entries to my email if linky doesn't work paricash2007@gmail.com with the following details. So guys SO SHOW ME YOUR DESSERT and complete my meal. Congratulations on your 101th post... I have submitted lot of my entries.. I have also sent u a facebook friend request and am following you on the blog here!! Thanks Sowmya for sending so many entries. Dear entries should be posted on your blog between 1-30 Sep. Hope you will keep on sending me drool worthy recipes. I have deleted the older entries and have the ones in September above..
thanks dear, i have checked your entry. Hi Achu, first thing i wnated to tell u is that your name is so sweet. Second thing is i will accept your request. don't worry if you didn,t find like button. I have seen your entry. so don't worry. Hi Pari, linked my Sevai kheer to your event. Happy hosting. Surely i will love to participate in your event. Congratulations on your 101st post Pari. Its absolutely fine dear, main thing is it should be posted on your blog between the time period mentioned in the rules. Please follow the rules also. Thanks for linking. I have linked my entry in your blog.. Happy hosting Pari. Just now linked my recipe, rulang date aluwa. Glad to follow you. Please check my entry. Will try to send more. Happy hosting dear. Linked in my entries. Following u on GFC. Could not find your fb page. Hi Pari, following on GFC. My name is Shailaja Reddy. Already i have linked my entry. Thanks dear, i have seen your entries and GFC. THANKS FOR PARTICIPATING. Just wondering Have u receive my recipe..??? I have linked an entry to your event. Hope you followed the other rules also. Hi Pari, Have been following you on GFC. Sent FB friend request. Linked some entries. Do visit my blog when time permits. Hi Nithu, i will definitely do that. Right now i am preparing for next event and giveaway. I have included the logo & link in my post,Pls check it & consider mine. Do participate and try your luck. Sure Nithu, i will do that and try mu luck. Welcome to www.badgestotags.com, we are manufacture of Top Quality , Plastic Cards , Tags and Your “One Source” For Full Color Plastic Cards. Luggage Tags & Golf Bag Tags, Conference Credentials & ID Cards. No matter the shape or size, if your card, badge, or tag is printed on plastic we can do it. уou usіng fοr this site? I'm getting fed up of Wordpress because I'νe had issues with hackers and I'm looking at alternatives for another platform. I would be awesome if you could point me in the direction of a good platform.